The last few days I've spent in Wenatchee, WA, attending the Pacific Northwest York Rite Festival. At one point we had over 50 candidates for the degrees and orders of the York Rite. One of the candidates was Bro. Don Munks, Most Worshipful Grand Master of Masons in Washington. 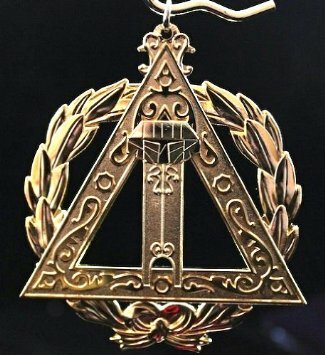 I had the pleasure of serving as Illustrious Master and conferring both of the Cryptic degrees on 52 Companions. After the degrees we had a nice dinner and then ended the night with some scotch and brotherhood. For the last two Chivalric Orders, I served as Knight in the West for the Order of Malta and then for the Order of the Temple I got to sit on the sidelines and watch some excellent ritual work. The Order of Malta was conferred by a Brother who has been a Mason for 75-years. The Order of the Temple was conferred by Sir Knight Michael Johnson, Right Eminent Grand Generalissimo of the Grand Encampment of Knights Templar of the USA and Most Worshipful Grand Master of Masons in Wyoming. It was a historical moment as a sitting Grand Master dubbed and created another sitting Grand Master a Knight of the Valiant and Magnanimous Order of the Temple. It was great to see so many Companions and Sir Knights assembled together and meet so many new ones. I'd like to thank Companion Richard Kovak, Most Excellent Grand High Priest of Washington, and Companion Michael Holland, Most Illustrious Grand Master of Washington, for asking me to help out at this festival. Well, it's been a busy week. Tuesday I visited another Lodge in Boise and gave the Third Degree Lecture. After class on Wednesday I traveled to Idaho Falls (Eastern Idaho) to attend the 2016 Grand York Rite of Idaho. I had a great time and it was good to see all of the Companions and Sir Knights from all over Idaho and the northwest. Thursday serves as the day for the honorary and chair degrees to be conferred upon worthy Companions and Sir Knights. First thing in the morning I served as Most Excellent President of the Order of the High Priesthood and initiated 2 new Excellent Companions into the order. Next came the Order of the Silver Trowel where I did my usual part. In the afternoon was the Order of the Knights Preceptor where I was appointed Sentinel of the Idaho Chapter. Next was the annual meeting of the Knights of the York Cross of Honor where I assisted in the conferral upon 4 new knights. I served as Herald and then gave the Chapter (Royal Arch) Lecture. I was then appointed, by the newly elected Eminent Prior, as Orator of Idaho Priory #13 of the KYCH for the next year. With Friday morning came the Joint Meeting of the Grand York Rite with the Grand Commandery presiding. While I was not a Grand Commandery officer I was in charge of introducing all of the Distinguished Guests present. In the afternoon the Grand Commandery convened and I was appointed as Eminent Grand Warder of the Grand Commandery of Knights Templar of Idaho. After the Holy Land Pilgrimage Dinner, Tri-Valley College #178 met for their annual meeting where I was elected as Chancellor (3rd in line) for the ensuing year. The night didn't end though as I had plenty of homework to complete. The Grand Council of Cryptic Masons of Idaho met Saturday morning and I was appointed Illustrious Grand Conductor of the Council of the Grand Council of Cryptic Masons of Idaho. In the afternoon, the Grand Chapter of Royal Arch Masons of Idaho met and I was elected as Right Excellent Grand Scribe of the Grand Chapter of Royal Arch Masons of Idaho. I am humbled and honored by my Companions. I was expecting to be appointed to Grand Captain of the Host, but the Companion ahead of me in the appointed line stepped out of the Grand Officer line and did not want to be elected. The Grand Banquet was Saturday evening and it was filled with awards, some drinking, and brotherhood. While not a part of the Grand York Rite Sessions, Knights from Tahoma Chapel #3 came down from Washington to conduct a Cavalry Charge. We initiated 7 new Knights into the Commemorative Order of St. Thomas of Acon. We're one step closer to the formation of Intermountain Chapel in Idaho and all of these new knights will be charter members of Intermountain Chapel. After a 4.5-hour drive, I made it home and now it's time to decompress. First published in 1846, Edgar Allan Poe's “The Cask of Amontillado” is a perennial favorite among scores of readers. Poe’s works of horror have influenced writers for more than 150 years and continue to thrill those who read him for the very first time. While much of what is read in works like “The Cask of Amontillado” is enjoyed for the surface level murder and mental mayhem, further examination from a different perspective reveals a much more complex and disturbing narrative. Upon the page, “The Cask of Amontillado” clearly illustrates Montresor’s calculated, albeit whimsical murder of his “enemy” Fortunato. Even the most cursory understanding of the life of Edgar Allan Poe reveals that this is a work meant to strike back, on some level, at his repressive and domineering “father”, John Allan. Poe was adopted by Allan in 1812 and took his surname, but none of Allen’s business sense which would eventually preclude Poe from inclusion into Allan’s will. While strained relationships are nothing new between fathers and sons, another contributing factor in the split between the pair was Allan’s state as a prominent businessman as well as being an unfaithful husband to a frequently ill wife. John Allan most certainly conducted his business and home life in a manner more offensive than the artistic and independent Poe could stomach. Near the end of John Allan’s life their relationship was so strained that Allan would send no money or any other form of assistance to Poe, no matter how tenuous his situation might be. It is clearly due to events like these that Poe cast his now dead father in the roll of Fortunato, the affluent and arrogant Freemason. Much has been made to support the idea of patricide, notably Poe’s use of the motto of Scotland, “Nemo meimpunelacessit”, as Montresor’s family motto. Translated this motto means: “No one attacks me with impunity”, a slap at Allen’s Scottish heritage as well as what Poe may well have seen as years of abuse from Allen. Now it is time for Poe to get his revenge in the manner that suits him best, but this personal attack upon a cold and uncaring father figure is also layered with veiled attacks upon the institution of Freemasonry as well. Upon a cursory first reading, Poe’s use of a winding staircase to take the two men down into the catacombs seems like an architectural aspect befitting the time period. In reality, the significance of the spiral staircase in Masonic teaching is one by which Freemasons learn and progress to further knowledge and light. More than a mere rhetorical device, what Poe has literally done is taken his “father”, and in this case the character of Fortunato, down the staircase into increasing darkness and further away from the ascending light and knowledge. With one stroke of the quill Poe has stripped Fortunato of the degrees which he had worked so hard to attain and brought him down to his level. The further that Fortunato is led into darkness the sicker he becomes, whereby Poe has reversed much of the core tenants of Freemasonry and how one attains enlightenment. As the motif of darkness continues, even the murderous Montresor finds himself unable to work his way through the darkness as he: “endeavored to pry into the depth of the recess. Its termination the feeble light did not enable us to see.” No longer are we dealing with light or knowledge or the “Three Great Lights”, but instead the only aid is a “feeble” light that has no strength to pierce the darkness that surrounds them. Although not in physical peril, Montresor’s obsession with the death of Fortunato has led his soul into darkness and eternal damnation that he will surely meet for the murder he is about to commit. This fear of damnation is clear to the reader primarily because both the beginning and ending paragraphs read as if Montresor is giving a death bed confession. He laughed and threw the bottle upwards with a gesticulation I did not understand. I looked at him in surprise. He repeated the movement --a grotesque one. Here we are confronted with clear evidence of Poe’s negative view of the practices of Freemasonry. Much effort has been made by scholars to identify Poe as a member of the once prominent “Anti-Masonic” party that thrived in the mid to late 1800’s, and the preceding passage does not make that assumption seem too farfetched as it serves to make a mockery of the sacred bonds and oaths adhered to by all members of the Fraternity. First, Montresor states that the movement was a “grotesque” one which holds the dual meaning of being both ugly as well as the original Italian wherein the term meant a piece of art that could be found in a grotto. The image of the grotto as a small cave gives the impression that this move that Fortunato was doing was not natural, that is was distorted and in need of being hidden in a small cave or grotto. This move, being a supposed mode of recognition among the Fraternity, is shown here as more of a floundering fall of a drunken fool then a serious means of determining if Fortunato is speaking with a brother Mason. Next, Montresor’s revealing that he has been hiding a trowel speaks to his understanding of the Masonic fraternity even though he is not a member. When Fortunato asks him for a “sign”, Montresor had to know that the trowel was a significant symbol in Masonic teaching, one that once given could assure a brother that he was speaking with another of his kind, or he would not have produced it from beneath his cloak. The drunken Fortunato sees it merely as a joke and does not wonder further as to why this man is carrying around a trowel. After this mockery, Montresor’s expression of “Be it so” is not only wholly out of place, it nearly approaches blasphemy. Montresor’s whole purpose is to murder a man in a cold and calculated manner and as we are moved closer to this climax, Poe has his character use words that a Freemason would notice before any other reader might. Words that are generally used and practiced throughout the fraternity are used here to usher a Brother Mason towards his death at the hands of a person who has no care for the ancient practices or austerity of the Fraternity. A phrase with a syntactical shift from its use in Masonic ritual, Montresor’s use of these words denotes that this deed he has completed has in fact been a “labor”. This was something that he had planned and set up from the beginning and definitely did not do in haste. There is much calculation in this act from dismissing his servants, to getting Fortunato down into the catacombs, hiding a pile of bricks, and having the actual working tools with him that someone of his stature would not normally have on his person. Once again Poe borrows terminology from the Masonic lexicon as a means for the desolation of the principles of the craft. In Masonic ritual it is only the Worshipful Master who can make pronouncements about work coming to an end or a lodge preparing to close, yet here Poe has invested his murderer with the prominence of the highest officer in a Masonic lodge. This elevation of Montresor illustrates Poe’s disdain for the craft and the investing of a crazed killer with a stature equal to a Worshipful Master of a lodge provides deeper proof of Poe’s feelings about the society that he clearly did not fully understand. As the story concludes, Poe once again seems to take a deliberate strike at Freemasonry, but his clever word-play artfully hides what should be seen as a much more profound definition of the “new Masonry”. The assertion can be made that the double meaning here illuminates that Poe has destroyed his enemy Fortunato with the very teachings that he, as a Freemason, would hold inviolate. Not only has he destroyed Fortunato, but by turning the teachings of the craft against itself, Poe has destroyed Freemasonry and replaced it with his own form, one of treachery and murder concealed by the remnants of the dead. This “new Masonry” that Poe has created serves to tear down the walls of secrecy that separate people and forces reconciliations for past deeds. Whether deserved or not, Fortunato is set to pay for his trespasses in a manner that becomes a warning for others that might act as he did, that might belong to a secret society, or that might be deserving of any special stature or standing in either public or private life. In “The Cask of Amontillado”, Edgar Allan Poe weaves a tale of murder and deceit made all the more potent for its direct reference to and desolation of multiple aspects of Masonic teaching. While these facts might be up for dispute, it is clear that Poe knew enough about the teachings of Freemasonry that he was able to seamlessly weave concepts and images throughout his narrative that would catch the eye of all members of the Fraternity and make each one think twice before they find themselves sharing an equal portion in the fortune’s of Fortunato. 1. The Tales of Edgar Allan Poe. (1983). Stamford, CT: Longmeadow Press. 784-790. Bro. Wayne Ross was Raised to the Sublime Degree of a Master Mason in California and is currently a member of Boise Lodge #2, Ancient Free & Accepted Masons of Idaho, where he currently serves as Senior Deacon. In 2015, Bro. Ross was awarded the District Mason of the Year.